There will be high jinx galore in Tralee this November, with the arrival of the National Circus Festival of Ireland. Featuring the Irish premiere of Svalbard Company of Sweden’s All Genius All Idiot show, as well as exciting appearances by Roxana Küwen, Mat Ricardo, Maleta, and many more, this promises to be a thrill for kids big and small. This is the 11th running of Ballyferriter’s Féile Bheag Filíochta poetry festival, a delightful celebration to brighten up the dark days of winter. Expect interesting lectures, readings, and workshops, as well as welcoming open- mic events. Early booking for the workshops is advised. (The festival is run through Irish, but poems in any language are accepted). You could make a dash between Ballyferriter and Sneem and top up your poetry with some quality storytelling at the Sneem Storytelling Festival. This year’s performers include U.S. storyteller Len Cabral, Kate from Cork and London, Kerryman Batt Burns, Kerrywoman Frances Kennedy, and Jack Lynch from Dublin. Mikel Murfi will also stage his one-man show The Man in the Woman’s Shoes, and there will be a pub trail, storytelling walk, workshops, and concerts. Get stuck into some comfort food at the Listowel Food Fair this November. Actor Simon Delaney will open the 2017 programme of events with local Flogas Ambassador and Sunday AM regular, Lizzy Lyons, from Lizzy’s Little Kitchen. The pair will cook dishes from Simon’s recent cookbook. Popular events returning for the 23rd running of the fair include cookery competitions, the craft fair, workshops for all ages (with an emphasis on children), and the eagerly awaited Best Emerging Artisan Food Producer Awards. Dance away the winter blues at the Torc Set Dancing Weekend at the Torc Hotel, Lissivigeen, Killarney. Enjoy music from three world-class ceili bands and top-quality set dancing workshops with Timmy Woulfe. 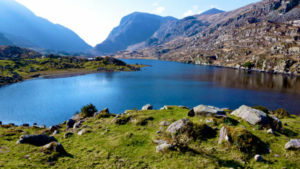 If a gentle stroll is not enough for you this winter, you might relish the challenge of the Run the Gauntlet half-marathon in the Gap of Dunloe this November 19th. Expect screaming thighs as you make the steep ascent to the head of the Gap, before plunging down to the Black Valley to the 10.5km mark, turning around, and doing the whole thing all over again!